I've been to various Chinese fast food restaurants but never have I tried dining at an authentic one. And then the opportunity came when I was invited for another Zomato foodie meetup at the first ever authentic Chinese restaurant here in the metro. A Taste of Mandarin started in 1997 which is operated by the Gaisano and they really hired a head chef from China. A Taste of Mandarin is a nice place when you're looking forward to trying authentic Chinese dishes. Upon entering the restaurant, you'll be welcomed by a giant Buddha. The Chinese aura of the restaurant is evident especially with the interiors, decors, and of course, the usage of the color red. Honestly, the place for me was quire intimidating because it looked "expensive". And although the prices of their food would indeed cost you a little more than what you usually spend when dining at restaurants, but trust me when I say that their food are good and worth trying. This is a green vegetable soup mixed with assorted fresh sea food. This soup was one of my favorites because it tasted like the Bird's Nest soup we commonly know but much better. A Chinese delicacy known for its rich taste and special manner of cooking. The price of this soup might shock you but this soup has high-quality ingredients such as Native Chicken, Shark's Fin, Abalone, and Sea Cucumber. A unique, sweet and creamy combination of fried prawns and fruit salad. It was my first time to taste a dish like this and I thought that prawns and fruit salad go well together. This is a crisp-tasting jelly appetizer with a little bit of chili paste. It was also my first time to taste a Century Egg and I was surprised that I quite like it. The seaweed and the Century Egg both had a jelly-like texture and I would have honestly thought this dish is a dessert. This dish is made of Australian scallop that was steamed and richly seasoned with garlic. And yes, I know. The price is appalling! I love scallops and this dish was delicious but I have to say that I can't afford to spend PHP 200 for just a piece. This dish has a combination of hot and cold varieties of food that will boost your appetite. This dish consisted of sweet and saucy roast pork, soyed chicken, kuchai rolls, stuffed taro, and a complimentary seaweed with Century egg side dish. Fried rice mixed with imported dried fish and chicken meat. Fried rice with pineapple and also placed in a pineapple. When I saw this served, I was so excited to try it because just like the other dishes, it's the first time that I tried eating fried rice in a pineapple. And it was indeed delicious. This fried rice is one of my favorites too. The Patatim is a dish that most of the Chinese really loves. I have tasted a Patatim once before and I did not like it. I was thinking twice in trying this one from A Taste of Mandarin and I'm glad that I did. The Patatim was very mouthwatering. I love how the meat was so tender that is falls off the bone on its own. By the way, Patatim is braised pork leg made with thick and sweet sauce. The steamed buns were really good too. And it's perfect if you dip it in the sauce. I have tried Orange Chicken from a Chinese fast food restaurant before (I'm pretty sure you're familiar with that) and I thought maybe the Lemon Chicken would taste as good. And indeed, it did taste so good. Even better than the Orange Chicken I have tried before. The battered chicken was still so crispy on the outside and the meat was tender inside. And the sweet lemon sauce was the perfect ending for this dish. It was so delicious that I finished off more than five pieces of chicken. It was my first time to try a Lapu-Lapu fish as well and it was good. The sourness of the thinly-sliced green mangoes were a great complement to the saltiness of the fish. This is like a peanut butter made into a soup. This dessert also comes with Lomaichi or glutinous rice balls. What's even more interesting about this dessert is that the peanuts are freshly ground every time. So that's a big plus, right? This dessert is made of blended fresh mango with tapioca balls and vanilla ice cream on top. Actually, we have made this dessert at home a lot of times already and I was quite surprised to see this in their menu. The only difference from our homemade version and theirs is that ours didn't have the ice cream. What I love about this dessert is it's so refreshing and it can satisfy people with sweet tooth like me. Overall, I had a great time at A Taste of Mandarin and I was happy that I was able to try authentic Chinese dishes. My top picks are the Pollonchai Soup, Lemon Chicken, Pineapple Fried Rice, and the Patatim with Steamed Buns. These are the dishes that I will order again when I go back. 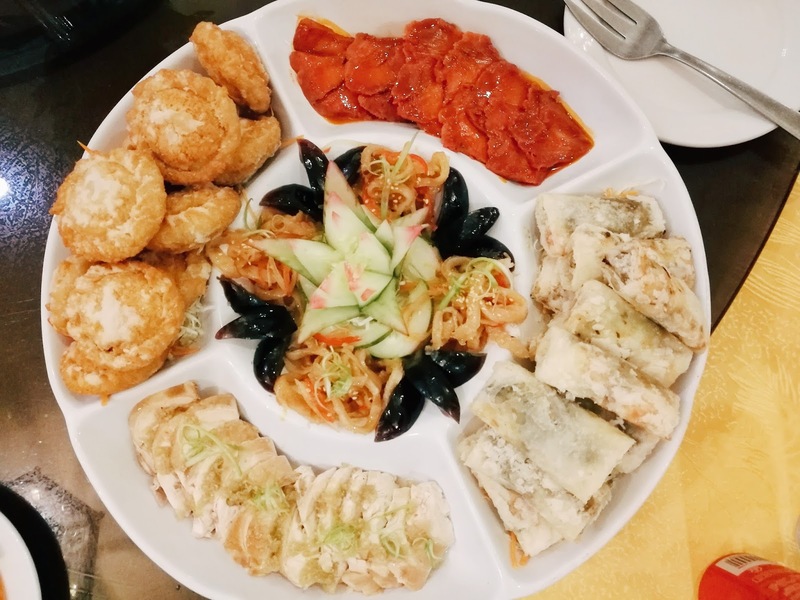 And although their menu is quite pricey, especially to the young professionals market, I think that dining at A Taste of Mandarin would be a good place to treat yourself for once in a while. Naaaaah lami jud sya Anne!! !